Many runners liked the lightweight built of the All Out Crush Light. It is a reasonably priced shoe. Some testers took note that this shoe is very comfortable. Delivers reliable traction while running on trail, based on some comments. The sole of the All Out Crush Light wears out quickly as mentioned in some reviews. Some noticed that cushioning is not a priority in this shoe. One of my favourite shoes is the Merrell Bare Access Flex, but it lacks grip and sturdiness for rougher trail conditions. The Merrell All Out Crush Light (MAOCL) both looks and feels sturdier, and it has a grippy outsole with decent sized lugs. So, when I coincidentally found the MAOCL cheaply on sale on the web I didn't hesitate for long. Buying running shoes "in the blind" is never optimal! But Hey: It's a Merrell! I love the Bare Access Flex and generally have only had good experiences with Merrell shoes in the past - what can possibly go wrong? Well, quite a few things! One thing is for sure, the MAOCL is not a Bare Access!! The MAOCL has been around for a while and is available in a range of colors. I went for the black/grey model that sports a black upper with grey laces, markings and text. A lighter grey midsole and some darker overlays - both sown and welded. However, if bright and colourful "is your thing" there are plenty options available that will suit your needs. A pretty anonymous and inconspicuous looking shoe that will not stand out or offend anyone. The fit, in general, is quite good, true to size, and rather comfortable - on the narrow side. They are easy to put on and they stay nice and tight when running. With traditional flat laces, a soft tongue and a soft upper with welded overlays you get an almost moccasin-like fit. The ankle collar height is standard. I found no sources of hot spots - except one! The very first thing I noticed when I put on the MAOCL was that it does not have the roomy toe-box of the Bare Access. On the contrary, the toe-box is tapered towards the toes - which is quite unlike most other Merrell shoes I have tried. Not as narrow as many dedicated fell and ocr shoes, but still much too tapered for my liking (and quite different to the official photos!). What a difference the shape makes! On the left is the unstable, narrow and tapered All Out Crush Light. On the right is the much wider and comfier Bare Access Flex. Same size (UK 7) with the heel counters flush. When you first put it on you do not sense it much, but after a while (an hour or so) you'll start to notice your pinky toes being squashed. At first, I put it down as "they need a bit of breaking in". Well past 100 kilometers I tried blaming it on always running on sandy beaches angled towards the ocean causing my feet to always slide to one side. But a change of scenery and route did not alter anything. Then I tried wearing thinner socks, then thicker socks, and finally no socks. Then I tried to get the MAOCL all wet and run water-logged for an hour. Then I tried to push my feet back by tightening the laces hard using the lace lock-down technique. Still no luck. Usually, I would also try to take out the insole. But as with most lightweight Merrell shoes, there is no separate insole. Some people hate this - I normally don't mind. Its a bit annoying when you need to empty the shoe of sand and grit. On the other hand, when there is no insole the sand/grit does not get underneath it, so there is no need to take it out. Anyway! After some 150 km I finally accepted that the toe-box just is fairly tapered and bugs my pinky toes. It's okay for the occasional easy run of short to medium length (max. an hour or so). Perhaps going up half a size would have helped, but that has not been an option to me. And since "the rest of the shoe" fits quite well when going with my usual size, I sincerely doubt going up a size would do much good. I have tried it before with other shoes, and usually, the extra toe-wiggle-room comes at the cost of a general misfit instead. The upper is made from a soft open-weave fabric, which apart from the odd overlay provides good ventilation. They also drain rather well and as such, they are excellent for wet trails. The disadvantage of the open-weave fabric is that it does not provide much protection against the elements. For example, it absorbs moisture quite readily and lets in grit and sand quite easily. Even with gaiters, they are not suitable for sandy routes. Furthermore, in the winter-time, they get too cold because they let in moisture/water way too easily. A water-proof band along the sides does allow you to run through the odd puddles without getting wet. But as soon as the vegetation is wet or its raining your feet are bound to get an instant and continuous soaking. Outwards lateral side with a grey logo and a plasticky band that will keep your feet reasonably dry when running in shallow puddles. Of course, there will always be some sort of trade-off with waterproofness, as you cannot have a shoe that at the same time is water-proof and also drains well. Some shoes shun water and drain less well, others like the MAOCL both take up moisture and drain easily. The later is no good for half of the year where I live. The MAOCL has a sort of toe-bumper made from a leathery material in a band around the front of the shoe. This provides a wee bit of protection from hard objects - protecting the odd toe-nail. But they are not going to save you day if you get into "serious stuff" ... such as off-track, rocky coastline or riverbed-like conditions. The extra toe bumper at the front of the MAOCL looks tough, but the material is unfortunately rather thin and pliable. Furthermore, despite its reasonably rough looks, the upper of the MAOCL is not very sturdy - the materials being mostly light and soft. It is fine for the park-trail-runner on easy to medium trails. But it is not a shoe to wear in mountainous or fell-like conditions. It is way too flimsy for that. The midsole sports an integrated EVA footbed, which provides a fair amount of cushioning. Most runners would probably still think of these shoes as somewhat minimal. However, in comparison to the Merrell Bare Access, the MAOCL feels quite beefy. What adds to this notion is the cushioning seems rather rigid to me. In comparison to other shoes in my current shoe arsenal, I find them somewhere in the middle cushion-wise. Too beefy to be considered minimal and too minimal to be considered cushioned. There is no dedicated rock-plate as such - but the MAOCL comes with a so-called "UniFly" midsole. This is supposed to distribute impact forces, and in my experience, they do this quite well. You do not feel the full brunt when stepping on hard and sharp objects, but at the same time, you get a fairly good feel for the track. The "UniFly" midsole is also supposed to offer support and stability. But on this, I am quite disappointed. In my opinion, they fail to provide the secure feeling that I require for technical or long runs. The main reason for this is (imho) the rather high (24 mm) stack in combination with a rather narrow midsole and a pointed toe-box. This nimble setup encourages speed and cutting corners, not stability and security. Compared to shoes like the Icebug Oribi or the Inov-8 Trail Talon, the MAOCL is more nimble, but it loses big time on stability. A narrow midsole platform in combination with a rather high stack makes for an unstable setup. The foot is removed too far from the ground, and you twist your ankles easily. The outsole consists of supposedly 5 mm deep three-pointed star-shaped lugs. They are arranged in bands across the outsole. The largest lugs right underneath the forefoot and smaller versions in bands in front of and behind the two main bands. This is in congruence with the rather low drop and actively encourage front/mid-foot striking. Bands of 5 mm deep, three-pointed, star-shaped lugs offer a nice grip on soft tracks. I have found that the three-pointed star lugs offer good traction in soft/muddy conditions, and I have had no issue with mud/clay build-up. The outsole material is also reasonably soft and provides an okay grip on rocks. Not nearly as good as for example Icebug Accelleritas or Inov-8 X Talon. On the other hand, it is more than sufficient for the type of run the MAOCL is otherwise suitable for. The upper shows little wear - and they even put in an extra welded overlay in the "critical spot" around the forefoot where it bends. This effectively protects the upper-fabric from the brunt of the wear. 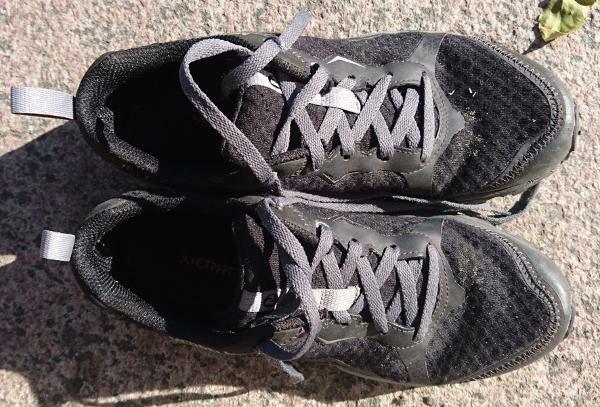 The aggressive lugs on the outsole, however, shows considerable wear already after a measly 150 km. Especially the sharp pointed ends of the lugs have clearly suffered. This is simply not okay at such low mileage. And I have mainly used my pair of MAOCL on a relatively easy mixed trail. The front rows of three-pointed star-shaped lugs show considerable wear, as opposed to those under the heel. With regards to durability, let's just say I would not buy the MAOCL for their longevity. Frankly speaking, I expect the lugs/outsole will be too uneven or even mostly gone by 3-500 km. This is (oddly enough) quite like the "magic milage" recommended by most shoe companies. I got my pair rather cheap on sale - and these days the MAOCL is easy to find on sale. At a considerable discount you'll get "enough milage" to justify a purchase - just don't expect them to last beyond the 500 km mark. The MAOCL is a very light shoe. My pair in size UK 7 weighs in at 408 grams in total or 204 grams each (after 150 km). Because of the low weight, they are quite fast, which is also reflected browsing through my Strava history. I have owned them for almost a year now, but I haven't put much mileage on them. There are several reasons for this. The main reason being that my current shoe arsenal contains plenty of better, more suitable and comfortable trail-shoes that I prefer over the MAOCL. "Who would drive a Fiat Punto, when there are Porches, Ferraris and Range Rovers in the garage!" Looking through my log the MOACL have mostly been selected for easy runs on semi-trail and park-like conditions. In other words, conditions where almost any ordinary/normal running shoe would have been quite sufficient. To be honest I find the MAOCL a bit of an odd beast. They are quite nice and light and not painful on the eyes either. However, they are not durable enough nor do they provide enough protection from the elements to become regulars. They are too high/unstable for technical runs. They are too uncomfortable for long runs. They do not feel tough or stable enough to be dragged through the mud in the forest or beaten up on rocky coastal tracks. They have a grip like a "real trail shoe", but the rest of the shoe simply does not "stack up" to the aggressive lugs. In my opinion, the problem with the MAOCL is that despite the individual details being okay (even good) they are not properly "tuned into each other". The grippy outsole is built for tough technical conditions, the midsole for easy/medium tracks, while the upper is better for a summertime stroll in the park etc. You end up not knowing where and when to wear this shoe. The MAOCL is a semi-all-round-ish, light trail shoe with a nice grip. It is suitable for short to medium length runs on light/easy trails in good weather conditions. They are also somewhat suitable for muddy/wet runs in the summertime - perhaps even a bit of summertime ocr. They are, however, not any good for rough and cold conditions, and they are too high and unstable for technical/difficult terrain. If you have somewhat tapered feet (toes) and is looking for a very light and nimble trail-shoe for the odd run in the park - you might find the MAOCL suitable. That is - however - also pretty much the only viable usage/purchase-scenario I can see for the MAOCL. If you happen to like the Merrell Bare Access range of shoes, don't make my mistake of thinking the MAOCL is a beefed-up version of the Bare Access! It is a completely different shoe - and not in a good way. 218 grams is not much for a shoe with such characters. Being the newest addition to Merrell’s off-road shoes, the All Out Crush Light features a breathable upper, which is made from woven fabric and TPU materials, make a great exterior. As enhanced with the TPU synthetic materials, this shoe is more durable and easy to clean and dry. The elasticity of the upper also adds a very distinct touch to trail running experience. A toe cap protection is also added in the upper design. The midsole of this lightweight running shoe are composed of the Uni Fly, an integrated EVA foot bed made of ultra-resilient foam, and TrailProtect pad, underfoot guard that protects the foot from sharp objects. Both of these are for comfort and protection on tough terrains, especially on off-road trails. This provides great impact absorption while keeping it soft on landing, thus foot is empowered for a great take off. For its outsole, the M-Select Grip is used, which is a compound of soft rubber with tear-resistant property. It has a self-cleaning set of lugs placed around edge, providing lateral movement. It also provides reliable grip on wet or dry weather. The All Out Crush Light comes true to size. Its upper materials are not just for a smart appeal, but for a comfortable fitting as well. The toe area is just at the right width, as well as the mid-foot area so that the foot can move well as it spread out along the stride. The outsole has the M-Select Grip Merrell technology. This is a rubber compound for abrasion resistance and non-slip purposes. The 5mm lug offers excellent grip and great traction on mud without slipping even on wet grounds. The midsole are made from soft and comfortable Uni-Fly foam cushioning and TrailProtect pad. These technologies make the shoe more protective and softer with a better ground feel on trails. The impact is properly dispersed and the aggressiveness is heightened for faster and longer performance. The upper comes with a new design of the combined breathable mesh and TPU synthetic materials. It offers not just the breathability, but the elasticity, durability, and comfort. Merrell also used the traditional lace closure system, but enhanced the toe area with the Toe Protect cap, thus adding protection against sharp objects on tough terrains.